This picture is old because I’m actually down to the fourth color of my rainbow Tecumseh sweater but I wanted to share a status update. And it’s moving along! Can we talk about how my BFF Jess bought me a neon rainbow sign for my office? It goes perfectly with my poop emoji speaker. My office has become a very bright and colorful space that I love walking into. Since I don’t have windows I’ve made sure there is pattern, color and light all around me. One of my students walked in on Monday and gasped, ‘there’s a rainbow in here!’ Which was the perfect reaction. So what are you working on, on this work in progress Wednesday? My cousin was a big poop emoji, rainbow and unicorn fan and passed away on 8/22. Your picture made me smile, so thank you so much! 🙂 I love the color in your sweater too. I can’t wait until I get done with some of my projects so I can work on a sweater for myself. Well I am sorry for your loss but happy I made you smile and think of your cousin. That’s awesome!!! And just a little deja vu, I was just on Rvlry and was looking at your pink/black sweater to see if you finished it and I was going to send you a comment to see if you just forgot to update your completion status when your blog post popped up! Really spooky! 🙂 Glad to see you’re still knitting your little heart out! And spreading colors from the rainbow wherever you go! Hooohaaa!!! Funny that you got poop on your desk, my husband has poop pillows😊. Your progress is coming along. 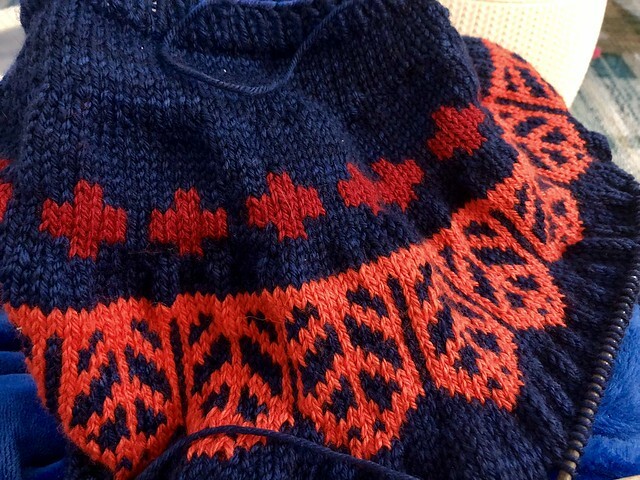 What was your first sweater that you knitted? It is going to be a gorgeous version!